Yesterday, I had a magical time visiting Winter Wonderland only fifteen minutes from my home. Every December Kim Fruits, owner of Rewindthyme Country Estate, offers Christmastime tours of her home. 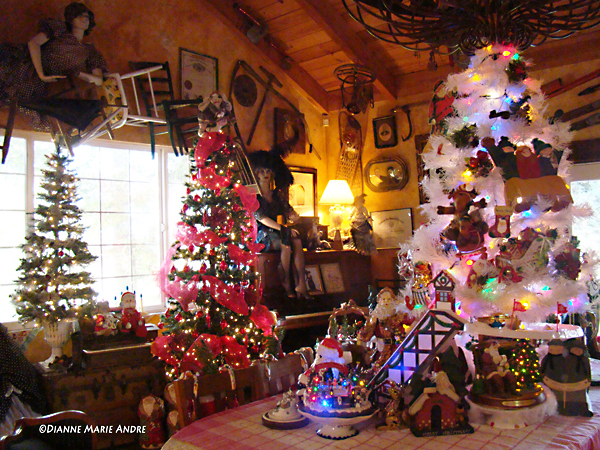 She puts on a beautiful display of over 50 decorated Christmas trees and hundreds of holiday memorabilia. As you can see in the photo, Kim also collects antiques (lots of antiques) and cleverly displays them in every room. I have toured Kim’s estate more than once and each time I am amazed at her God-given talent and how she brings joy to others. To learn more about Winter Wonderland and tour availability click here. To learn more about Kim’s story, click here. This entry was posted in Blog and tagged Antique Tours, Christmas events, house tours, Lodi Wine Country, photography, Rewindthyme Country Estate, Winter Wonderland Tour. Bookmark the permalink.